"hi is there anyway to compress bd50 3d bluray movies to bd25 bluray? or anyway i can compress 3D BD50 to BD25 via 3d bluray editing software? i’ve tried bd rebuilder but when i play movie its unplayable. power dvd says it cant read disk and on ps3 or pc it doesnt work. i’ve tried a few 3d blurays but same problem on ps3." – By imran 333 on "compress bd50 3d bluray to bd25". "Is it possible to shrink it to BD25 keeping all features, 3D, menus and languages as we do in 2D? Also after shrinking 3D BD50 to BD25 keeping everything is it possible yet to add a subtitle to it?" – By danswano on "How to shrink 3D BD50 to BD25". With fast development of 3D technology, people could now even watch 3D movies at home with their 3D home theatre system. Many people purchased 3D Blu-ray discs to watch 3D Blu-ray movies at home with family, and many movie fans may collect their favorite movies in 3D Blu-ray disc. Therefore, this is increasing demand of backup 3D Blu-ray disc. Some people may wonder and look for an effective solution to copy and compress 3D BD50 to BD25 disc. So, is it possible to copy 3D BD50 to BD25 with 3D effects retained? Actually, this would depend on 3D Blu-ray copy software you’re using. General 3D BD shrink app couldn’t do this. Any non-trivial modification of a BD3D ISO would either completely lose the 3D, or make it unusable. However, if you take use of some advanced 3D Blu-ray copy software, you could make it. This guide would introduce you wonderful 3D Blu-ray shrink apps to help you shrink 3D BD50 to BD25 with 3D effects, subtitles, and audio tracks retained. Part 3: What are video upscaling and what Blu-ray players support it? To shrink 3D BD50 to BD25, you need a professional 3D Blu-ray shrink app that could shrink 3D BD50 to BD25 with 3D effects, subtitles and audio trakcs retained. Leawo 3D Blu-ray Cloner is your best choice to do this. As a professional Blu-ray shrink software app, it could copy and shrink Blu-ray/DVD disc, folder and/or ISO image file in both 2D and 3D to computer or blank disc. It supports to copy Blu-ray/DVD disc in 1:1, movie only backup, and compress 3D BD50 to BD25 with high quality. While used to convert 3D BD50 to BD25, it could retain all elements in source 3D BD50 disc, including: 3D effect, disc menu, subtitles and audio tracks. ☉ One click copy 3D/2D Blu-ray/DVD disc to hard drive as ISO or folder. ☉ Copy and compress 3D/2D Blu-ray/DVD discs with high quality. ☉ Select full movie, main movie or desired chapters to copy. ☉ One-click operation to copy ISO file to Blu-ray/DVD disc. ☉ Shrink and copy 3D BD50 to BD25 with 3D effects, sutitle and tracks. ☉ Multi-language support like English, French, German, etc. What Makes Leawo Blu-ray Copy Stand Out? High quality disc compression, including: compress 3D BD50 to BD25 with 3D effects, BD50 to BD25, DVD-9 to DVD-5, and BD to DVD. Copy and backup Blu-ray/DVD movies in 3 different copy modes: Full Movie, Main Movie and Custom Mode. Choose desired one at will. Copy Blu-ray/DVD to ISO image file, or copy ISO image file to Blu-ray/DVD disc in one click. Create ISO image file in one click. Offers extremely easy to use interface for both novices and vateran. No special technology knowledgement is required. Download, install and run Leawo Blu-ray Copy on your PC via the links above. Get source 3D BD50 disc and target blank writable BD25 disc ready. Insert source 3D BD50 disc into one Blu-ray recorder drive and insert blank writable BD25 disc into the other Blu-ray drive. Launch Leawo Blu-ray Copy, open the "Copy" tab, and click the "Add Blu-ray/DVD" button to load 3D BD50 disc from Blu-ray disc drive. After adding source 3D BD50 disc, move mouse to the bottom left corner and select "Full Movie" mode, and determine "BD-25" as output disc type. It should be noted that under "Full Movie" mode, all subtitles, audio tracks, disc menu, and 3D effects of original 3D BD50 disc would be retained in output disc. Click the big green “Copy” button. On the popup sidebar, set “Copy to”, “Disc Label” and “Save to” option. Since you’ve already inserted blank writable BD25 disc into the other Blu-ray drive, select it as output target under the "Copy to" option. If you only get one Blu-ray recorder drive, choose to copy 3D BD50 to BD25 ISO image file first by choose "ISO File" under "Copy to" option and then follow the "Situation 2" to learn how to copy 3D BD25 ISO file to BD25 disc. Click “Copy” button on the right sidebar. This Blu-ray Copy software would start to shrink and compress 3D BD50 to BD25 immediately with high quality. After you shrink BD50 3D to BD25 ISO image file, eject the inserted 3D BD50 disc and insert a blank writable BD25 disc into the Blu-ray recorder drive. 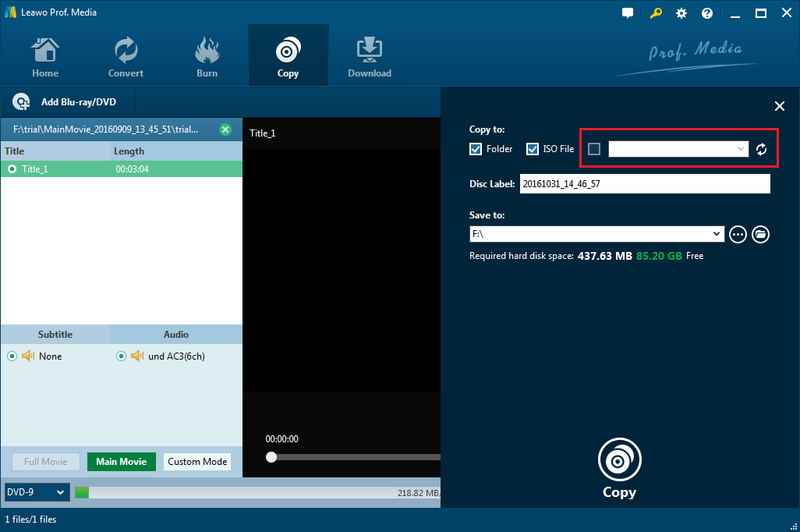 Under the "Copy" tab of this program, click the drop-down arrow icon next to the "Add Blu-ray/DVD" button and then select "Add iso file" option to load created BD25 ISO image file. You will need to choose a copy mode and set disc type again. This time you should still go with Full Movie mode and BD25 for disc type. Click the Copy button in the upper-right and check the third-option under the Copy to label and then start burning the ISO file to the rewritable disc by clicking the Copy button at the bottom. Note: This tutorial offers only feasible solutions to shrink 3D BD-50 to BD-25 disc, with no intention to encouraging you to break local laws for removing Blu-ray disc protection. So, check your local law upon DRM protection first and make sure you’re copying your own 3D BD50 to BD25 disc for no business purposes. Leawo Blu-ray Copy is capable of copying DVDs as well. In fact, if you need, you can copy DVD-9 to DVD-9 or copy DVD-9 to DVD-5 easily with the help from this program. #1. What Is Video Upscaling? Video up-scaling is designed to improve an image quality of lower resolution video signals, to mathematically match the pixel count of the output of a standard or not HD video signal to the displayable physical pixel count on an HDTV. However, the up-scaling process cannot magically convert a lower resolution to a higher one, which is merely an approximation. It is said that most Blu-ray Disc players have built-in video up-scaling to offer better quality playback of standard DVDs. Check below to find out which Blu-ray players could satisfy your need. With OPPO UDP-203 Ultra HD Blu-ray Disc Player,you can enjoy your favorite entertainment in greater quality with full HD 1080P Playback via HDMI. As one of the ideal sources to complete the ultimate home theater and sound room, it can conform even lower-resolution content to 1080P display with the Blu-ray player’s 1080P Resolution Upscaling feature, which allows for a greater range of color contrast and brightness, enhancing details from the original film format. To experience the best picture and sound quality available combined with advanced technology, you can try Samsung BD-J5100 Blu-ray Disc Player, for it features full HD 1080P Playback via HDMI, 1080P Resolution Upscaling, Dolby TrueHD, and DTS- HD Master Audio. What is more, it is easy to set up and has a start mode as quick as 0.5 seconds. With just one HDMI cable, you can get an external display and enjoy the highest quality audio and video entertainment. 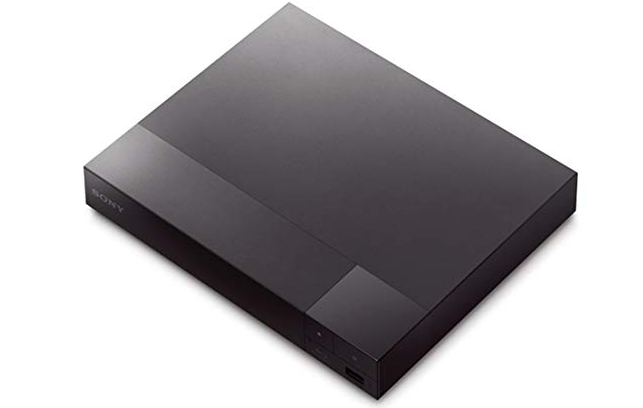 It is reported that Sony BDPS3700 Streaming Blu-ray Disc Player can stream from 300+ entertainment services and help watch Blu-ray movies-all from only one device. With this excellent Blu-ray Disc Player, you can feel free to view vivid content on your TV with Full HD 1080P Blu-ray Disc playback & DVD upscaling, premium sound, Improved boot-up and loading times with super Quick Start. Time to control the device and browse excellent content from a mobile device with TV Side View. To scenes burst with vivid color, stunning contrast, and deep detail, Samsung’s UHD Blu-ray player is your best choice, for its 4K UHD resolution could deliver 4 times the detail of HD, with an expanded color spectrum and High Dynamic Range. Time to access your favorite apps, content, and sports with this fantastic Blu-ray Player to get ultimate home entertainment. A suitable Blu-ray player with the upscaling feature can improve your movie watching experience. If you want better video and audio quality on Blu-ray, just give the recommended Blu-ray Player a try.